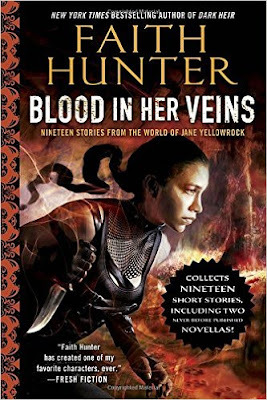 Blood In Her Veins is another compilation of great Jane Yellowrock short stories and novellas. Cat o’ Nine Tales is a previously released audiobook and most of Blood In Her Veins (about 50% of it) is everything that is in Cat o’ Nine Tales, just in print now. I reread some of my favorites from the first book, but mostly skipped to the new stories. I’m only going to talk about those in detail, but know that all of the stories are great and I highly recommend all of them! This one follows Liz and Cia- Everheart sisters and twins. They help a former classmate track down her missing mother, and along the way they run into some old vampire skeletons in the closet. Nell is our MC here. She’s a new character for us, but we will get to know her very well this fall when Blood of the Earth comes out; Faith’s new series featuring Nell! Her story is really interesting and I am so excited for it. Nell is a kinda-witch who escaped life on a cult compound. Jane Yellowrock meets Nell after a Master Vamp in Tennessee requests help locating a lost member. Molly solves the mystery of why a teapot belonging to a vampire keeps showing up in Angie’s toy box. I love Molly stories and seeing her protect her kits. Jane is sent to broker peace between the vamps and witches of Oiseau (again). This novella is pretty long and had a lot of things going on. It didn’t have as quick a pace as I like to see in a short story, but it was still an enjoyable read. It actually read like a scene that was cut from a book; it was a bit more spread out, like we would have time to be there a while. It did have delightful mentions of bayou food. This is high up on my list of favorite JY shorts. Molly and Angie Baby are in New Orleans to meet with the NO coven prior to the big council meeting coming up. They’re attacked by a young arcenciel trying to alter the timeline of someone with them. This one has a big cast and I love them all. If you haven’t read any of the Jane Yellowrock books, I severely recommend them, especially in audio book format. Read my review of those here. These are my favorite urban fantasy books by leaps and bounds. Beast is one of my top five book characters of all time.